Whether you opt for hard work or Smart work in the present world which is more focused on result orientation is the key issue being raised in the GD Round at top B-schools. "Without hard work, nothing grows but weeds." said Gordon B. Hinckley which clearly states the importance of consistency and hard work if you want to achieve good in your life. But working hard doesn't always offer success on a plate for you, if not applied with brains. 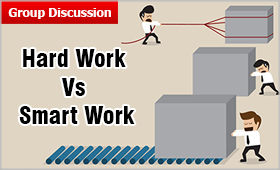 So the debate is going on which one to prefer Hard Work or Smart Work. A hard worker is a person who consistently works towards what he perceives to be worth working, regardless of how dynamic the situation might be. Success for the Hard Worker doesn't come overnight but only after putting in long hours at work and depriving himself of the comforts of life. Allen F. Morgenstern said way back in the 1930s “work smarter… not harder”. The reason behind it is that a smart worker is a person who works towards what he perceives to be worth working for and applies his brain and efforts in the most efficient manner with the help of integration of both. It guarantees successful results with minimal human energy wasted. Should have in-depth knowledge of the field of choice. Having an optimistic approach in life. Having control on one's emotions. Our Prime Minister Narendra Modi told about his travel schedule in an interview with economic times that he always would travel in night so that he can sleep in the flight and work on the next day. Vodafone CEO, Vittorio Colao wakes up at 6 a.m. followed by 40 minutes of exercise, then works with nearly taking no breaks until 10:45 p.m., pausing for family dinner. Fiat and Chrysler CEO Sergio Marchionne runs businesses in two different continents. When he's in The USA, he has to get up at 3:30 a.m. to start dealing with Europe. What is in your best interest? An integrated approach of Smart Work - working while prioritizing your work which results in achieving faster and longer lasting success combined with hard work - consistently work towards what you perceive to be worth working for is needed to achieve the success goal. If you are not well versed with the topic and fee a bit confused on it, try to gather information from first 1-2 speakers and then place your view point. Since GD is a sort of debate, you should have a clear view point on the topic – either for or against. Don’t keep crossing the floor. It will leave a bad impression and you may be out of the race. Use the quote and data, if you are sure of the source else leave it. You may encounter volley of questions on the economic statistics, trade data or historical facts from your fellow participants. Unless very sure, don’t use it. Speak in a firm and audible voice. Don’t shout as it wouldn’t do any good. Linking of Aadhaar: Is making Aaadhar mandatory a good idea? FDI in retail: Good for India? GST: Will economy grow faster with reduced rates of Goods & Services Tax? Merger of Public Sector Banks: How beneficial is the merger of Banks? Beti Bachao Beti Padhao: Will it abolish the orthodox mindset?